For other ships with the same name, see List of ships named HMS Terror. On 12 September 2016, the Arctic Research Foundation announced that the wreck of Terror had been found in Nunavut's Terror Bay, off the southwest coast of King William Island. The wreck was discovered 92 km (57 mi) south of the location where the ship was reported abandoned, and some 50 km (31 mi) from the wreck of HMS Erebus, discovered in 2014. HMS Terror was a Vesuvius-class bomb ship built over two years at the Davy shipyard in Topsham, Devon, for the Royal Navy. Her deck was 31 m (102 ft) long, and the ship measured 325 tons burthen. The vessel was armed with two heavy mortars and ten cannon, and was launched in June 1813. Terror saw service in the War of 1812 against the United States, during which the ships of the North America and West Indies Station of the Royal Navy blockaded the Atlantic ports of the United States and launched amphibious raids from its base in Bermuda, leading up to the 1814 Chesapeake campaign, a punitive expedition that included the Raid on Alexandria, the Battle of Bladensburg, the Burning of Washington, and the Battle of Baltimore. Under the command of John Sheridan, she took part in the bombardment of Stonington, Connecticut, on 9–12 August 1814. She also fought in the Battle of Baltimore in September 1814 and participated in the bombardment of Fort McHenry; the latter attack inspired Francis Scott Key to write the poem that eventually became known as "The Star-Spangled Banner". In January 1815, still under Sheridan's command, Terror was involved in the Battle of Fort Peter and the attack on St. Marys, Georgia. After the war, Terror was laid up until March 1828, when she was recommissioned for service in the Mediterranean Sea, but was removed from active service when she underwent repairs for damage suffered near Lisbon, Portugal. In the mid-1830s, Terror was refitted as a polar exploration vessel. Her design as a bomb ship meant she had an unusually strong framework to resist the recoil of her heavy mortars; thus, she could withstand the pressure of polar sea ice, as well. In 1836, command of Terror was given to Captain George Back for an Arctic expedition to Hudson Bay. The expedition aimed to enter Repulse Bay, where it would send out landing parties to ascertain whether the Boothia Peninsula was an island or a peninsula. Terror was trapped by ice near Southampton Island, and did not reach Repulse Bay. At one point, the ice forced her 12 m (39 ft) up the face of a cliff. She was trapped in the ice for ten months. In the spring of 1837, an encounter with an iceberg further damaged the ship. She nearly sank on her return journey across the Atlantic, and was in a sinking condition by the time Back was able to beach the ship on the coast of Ireland on 21 September. Terror was repaired and assigned in 1839 to a voyage to the Antarctic along with Erebus under the overall command of James Clark Ross. Francis Crozier was commander of Terror on this expedition, as well as second-in-command to Ross. The expedition spanned three seasons from 1840 to 1843 during which Terror and Erebus made three forays into Antarctic waters, traversing the Ross Sea twice, and sailing through the Weddell Sea southeast of the Falkland Islands. The dormant volcano Mount Terror on Ross Island was named after the ship by the expedition commander. 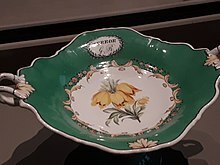 Sample of dishware carried by Terror, showing vessel name and the cypher for King George. Before leaving on the Franklin expedition, both Erebus and Terror underwent heavy modifications for the journey. They were both outfitted with steam engines, taken from former London and Greenwich Railway steam locomotives. Rated at 25 hp (19 kW), each could propel its ship at 4 knots (7.4 km/h). The pair of ships became the first Royal Navy ships to have steam-powered engines and screw propellers. Twelve days' supply of coal was carried. Iron plating was added fore and aft on the ships' hulls to make them more resistant to pack ice, and their decks were cross-planked to distribute impact forces. Along with Erebus, Terror was stocked with supplies for their expedition, which included among other items: two tons of tobacco, 8,000 tins of preserves, and 7,560 L (1,660 imp gal; 2,000 US gal) of liquor. Terror's library had 1,200 books, and the ship's berths were heated via ducts that connected them to the stove. 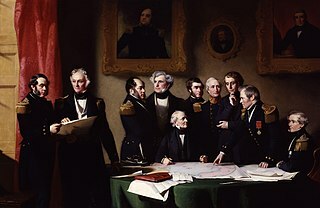 Their voyage to the Arctic was with Sir John Franklin in overall command of the expedition in Erebus, and Terror again under the command of Captain Francis Rawdon Moira Crozier. The expedition was ordered to gather magnetic data in the Canadian Arctic and complete a crossing of the Northwest Passage, which had already been charted from both the east and west, but never entirely navigated. It was planned to last three years. The expedition sailed from Greenhithe, Kent, on 19 May 1845, and the ships were last seen entering Baffin Bay in August 1845. The disappearance of the Franklin expedition set off a massive search effort in the Arctic and the broad circumstances of the expedition's fate were revealed during a series of expeditions between 1848 and 1866. Both ships had become icebound and were abandoned by their crews, all of whom died of exposure and starvation while trying to trek overland to Fort Resolution, a Hudson's Bay Company outpost 970 km (600 mi) to the southwest. Subsequent expeditions up until the late 1980s, including autopsies of crew members, revealed that their canned rations may have been tainted by both lead and botulism. 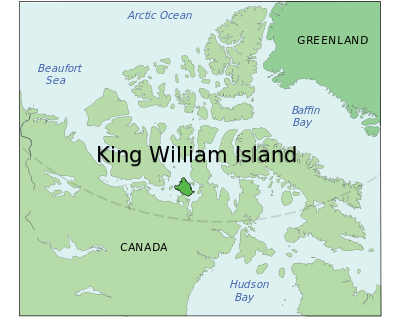 Oral reports by local Inuit that some of the crew members resorted to cannibalism were at least somewhat supported by forensic evidence of cut marks on the skeletal remains of crew members found on King William Island during the late 20th century. HMS Terror was found off the south coast of King William Island, highlighted. On 15 August 2008, Parks Canada, an agency of the Government of Canada, announced a C$75,000 six-week search, deploying the icebreaker CCGS Sir Wilfrid Laurier with the goal of finding the two ships. The search was also intended to strengthen Canada's claims of sovereignty over large portions of the Arctic. Further attempts to locate the ships were undertaken in 2010, 2011, and 2012, all of which failed to locate the ships' remains. On 8 September 2014, it was announced that the wreckage of one of Franklin's ships was found on 7 September using a remotely operated underwater vehicle recently acquired by Parks Canada. On 1 October 2014, Canadian Prime Minister Stephen Harper announced that the remains were that of Erebus. On 12 September 2016, a team from the Arctic Research Foundation announced that a wreck close to Terror's description had been located on the southern coast of King William Island in the middle of Terror Bay (68°54′N 98°56′W﻿ / ﻿68.900°N 98.933°W﻿ / 68.900; -98.933﻿ (Terror Bay)), at a depth of 69–79 ft (21–24 m). The remains of the ships are designated a National Historic Site of Canada with the exact location withheld to preserve the wrecks and prevent looting. Sammy Kogvik, an Inuit hunter and member of the Canadian Rangers who joined the crew of the Arctic Research Foundation's Martin Bergmann, recalled an incident from seven years earlier in which he encountered what appeared to be a mast jutting from the ice. With this information, the ship's destination was changed from Cambridge Bay to Terror Bay, where researchers located the wreck in just 2.5 hours. According to Louie Kamookak, a resident of nearby Gjoa Haven and a historian on the Franklin expedition, Parks Canada had ignored the stories of locals that suggested that the wreck of Terror was in its namesake bay, despite many modern stories of sightings by hunters and from airplanes. The wreck was found in excellent condition. A wide exhaust pipe that rose from the outer deck was pivotal in identifying the ship. It was located in the same location where the smokestack from Terror's locomotive engine had been installed. The wreck was nearly 100 km (62 mi) south of where historians thought its final resting place was, calling into question the previously accepted account of the fate of the sailors, that they died while trying to walk out of the Arctic to the nearest Hudson's Bay Company trading post. The location of the wreckage, and evidence in the wreckage of anchor usage, indicates continued use, raising the possibility that some of the sailors had attempted to re-man the ship and sail her home (or elsewhere), possibly on orders from Crozier. On 23 October 2017 it was announced by the UK's defence minister, Sir Michael Fallon, that his government would be giving HMS Terror as well its sister ship HMS Erebus to Canada, retaining only a few relics and any gold, along with the right to repatriate any human remains. Edwin Henry Landseer's Man Proposes, God Disposes (1864) was inspired by the fate of Terror and Erebus on the Franklin expedition. Terror and Erebus (1965) is a verse play for CBC Radio by Canadian poet Gwendolyn MacEwen, subsequently published in her collection Afterworlds (1987). Mordecai Richler's novel Solomon Gursky Was Here (1989), in which Ephraim Gursky survives the expedition and lives to pass on his Judaism and Yiddish to some of the local Inuit. Terror and Erebus (A Lament for Franklin) (1997) is an oratorio for solo baritone and chamber ensemble by Canadian composer Henry Kucharzyk, adapted from MacEwen's verse drama and crediting her for its libretto. 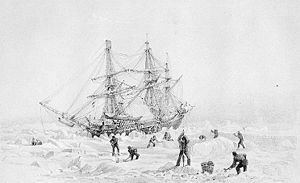 Dan Simmons' novel The Terror (2007), a fictionalized account of Captain Sir John Franklin's lost expedition of HMS Erebus and HMS Terror to the Arctic, in 1845–1848, to force the Northwest Passage. In the novel, while Franklin and his crew are plagued by starvation and illness, and forced to contend with mutiny and cannibalism, they are stalked across the bleak Arctic landscape by a monster. The novel has been adapted as an eponymous 2018 television series by cable TV channel AMC. Clive Cussler's novel Arctic Drift (2008), in which Erebus and Terror contain a mysterious silver metal which holds the key to solving the characters' mystery. In July 2013, an anonymous miniaturist began reconstructing a 1:48 scale model of HMS Terror, documenting the process on buildingterror.blogspot.com. In June 2017, it was announced that the model HMS Terror would be shown alongside the historical model of HMS Erebus (c.1839) in the "Death in the Ice" exhibit at the National Maritime Museum in Greenwich (July 2017 – January 2018). A corresponding Twitter account for "Building Terror" was created in December 2017. Terror & Erebus is a chamber opera for six singers and percussion quartet by Canadian composer Cecilia Livingston, to premiere in 2019. The Erebus and the Terror, an instrumental piece composed by Mícheál Ó Domhnaill, is the third track on the 1987 album Something of Time by Nightnoise. Mount Terror on Ross Island, near Antarctica, was named for the ship by Captain Ross, who also named a nearby and slightly taller peak to the west, Mount Erebus. Erebus and Terror Gulf, in Antarctica. Named for the vessels used by Royal Navy Captain Sir James Clark Ross in exploring the area in 1842–43. Terror Bay on King William Island was named in 1910, long before the discovery of the wreck there. ^ Bourne, John (1852). "Appendix, Table I: Dimensions Of Screw Steam Vessels In Her Majesty's Navy". A treatise on the screw propeller: with various suggestions of improvement. London: Longman, Brown, Green, and Longmans. p. i. ^ a b c d e f "HMS Terror". Parks Canada. 4 August 2015. Retrieved 14 September 2016. ^ a b c d e f g h i j k l Pope, Alexandra (12 September 2016). "Five interesting facts about the HMS Terror". Canadian Geographic. Retrieved 14 September 2016. ^ a b c d e Paine, Lincoln P. (2000). Ships of Discovery and Exploration. Houghton Mifflin. pp. 139–140. ISBN 0-395-98415-7. ^ "Shipping Intelligence". Caledonian Mercury (18324). Edinburgh. 28 September 1837. ^ Gow, Harry (12 February 2015). "British loco boiler at the bottom of the Arctic Ocean". Heritage Railway. Horncastle: Mortons Media Group Ltd (199): 84. ISSN 1466-3562. ^ a b Gopnik, Adam (24 September 2014). "Canada Rediscovers the Mythos of the Franklin Expedition". The New Yorker. Retrieved 14 September 2016. ^ a b c d Watson, Paul (12 September 2016). "Ship found in Arctic 168 years after doomed Northwest Passage attempt". The Guardian. Retrieved 13 September 2016. ^ Boswell, Randy (30 January 2008). "Parks Canada to lead new search for Franklin ships". Windsor Star. Retrieved 30 August 2013. ^ "2012 search Expedition for Franklin's ships HMS Erebus and HMS Terror". Office of the Prime Minister (Canada). 23 August 2012. Archived from the original on 5 October 2013. ^ "Sir John Franklin: Fabled Arctic ship found". BBC News. 9 September 2014. ^ "Lost Franklin expedition ship found in the Arctic". CBC News. 9 September 2014. ^ a b Pringle, Heather (13 September 2016). "Unlikely Tip Leads to Discovery of Historic Shipwreck". National Geographic. Retrieved 14 September 2016. ^ Erebus and Terror. Canadian Register of Historic Places. Retrieved 29 October 2013. ; "National Historic Sites of Canada System Plan". Parks Canada. 8 May 2009. Archived from the original on 24 September 2005. Retrieved 30 August 2013. ; "National Historic Sites of Canada System Plan map". Parks Canada. 15 April 2009. Archived from the original on 29 May 2006. Retrieved 30 August 2013. ^ a b c Sorensen, Chris (14 September 2016). "HMS Terror: How the final Franklin ship was found". Maclean's. Retrieved 14 September 2016. ^ Barton, Katherine (15 September 2016). "No camera, no proof: Why Sammy Kogvik didn't tell anyone about HMS Terror find". CBC News. Retrieved 16 September 2016. ^ Ducharme, Steve (24 October 2017). "HMS Erebus ship's bell recovered from Franklin expedition". Nunatsiaq News. ^ "Soundmakers – Terror and Erebus by Henry Kucharzyk". www.soundmakers.ca. Retrieved 24 January 2018. ^ Finn, Jessica (1 December 2014). "Building a scale model of HMS Terror". Canadian Geographic. ^ "HMS TERROR TO CROSS THE ATLANTIC ONCE AGAIN". buildingterror.blogspot.ca. Retrieved 24 January 2018. ^ "EREBUS AND TERROR TOGETHER AGAIN". buildingterror.blogspot.ca. Retrieved 24 January 2018. ^ "Erebus and Terror Gulf". Geographic Names Information System. United States Geological Survey. Retrieved 2 March 2012. ^ Natural Resources Canada. "Terror Bay". Geographic Names Board of Canada. Beardsly, Martyn: Deadly Winter: The Life of Sir John Franklin. ISBN 1-55750-179-3. Beattie, Owen: Frozen in Time: The Fate of the Franklin Expedition. ISBN 1-55365-060-3. Berton, Pierre: The Arctic Grail. ISBN 0-670-82491-7. Cookman, Scott: Ice Blink: The Tragic Fate of Sir John Franklin's Lost Polar Expedition. ISBN 0-471-37790-2. James, William (1827). The Naval History of Great Britain, Volume 6, 1811 – 1827. Conway Maritime Press. ISBN 0-85177-910-7. McGregor, Elizabeth: The Ice Child. Ronchetti L, Clement D, William-Hawkes E:HMS Terror: a Topsham Ship - Published by Topsham Museum Society [ISBN unspecified]. Simmons, Dan: The Terror (Fictionalized account of the Franklin expedition). ISBN 0-593-05762-7 (UK H/C). Smith, Michael: Captain Francis Crozier: The Last Man Standing?. ISBN 1-905172-09-5. Wikimedia Commons has media related to HMS Terror (ship, 1813). HMS Terror model (as built) & display in Topsham museum, Topsham, Devon, England. CCGS Sir Wilfrid Laurier is a Martha L. Black-class light icebreaker and major navaids tender of the Canadian Coast Guard. Built in 1986 by Canadian Shipbuilding at Collingwood, Ontario, Canada, she was the last ship constructed there. The ship has been based out of Victoria, British Columbia. Terror Bay is an Arctic waterway in the Kitikmeot Region, Nunavut, Canada. It is located in the south western side of King William Island. The entrance to the bay is marked by Fitzjames Island on the west and Irving Islands to the east. The Bay opens to Queen Maud Gulf.